Liferay’s Chat portlet provides a convenient way of allowing users to send each other instant messages when they are logged into your web site. It appears as a bar at the bottom of every page, showing who is logged on, their statuses, and any chats the logged-in user has open. The Chat portlet is distributed with the Liferay bundles, but is not included as part of the .war distribution, as it is a separate plugin. If you installed the Liferay .war manually on your application server, you can install the Chat portlet by going to the Control Panel, clicking Plugins Installation, and then clicking the Install More Portlets button. Find the Chat portlet in the list, click on it, and then click Install. The Chat portlet is very simple to use. To change the settings, click Settings (found near the lower right corner next to Online Friends). Here you can set your status, choose whether or not to show that you are online, and whether or not to play a sound if someone sends you a message while you have the window or tab in the background. The Chat portlet displays the number of your friends who are online. 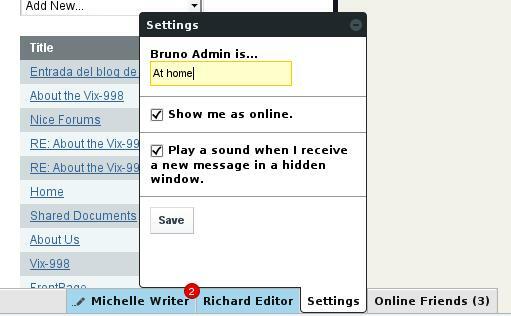 Click the Online Friends link and then click on a friend’s name to open a chat window. You can have multiple chats open at a time, and can have one or more of them minimized. Liferay 6.1 introduced Jabber server integration to Liferay’s Chat portlet. Jabber is the original name of the XMPP (Extensible Messaging and Presence Protocol) protocol, an open-standard communications protocol based on XML. Using a chat server helps Liferay’s chat scale to very large installations and allows for communication between different chat clients. For example, Jabber server integration allows users using the chat portlet in their browser windows to chat with other users using desktop clients like Empathy, Pidgin, or Kopete. Jabber server integration is not enabled by default since it requires a running Jabber server. Once you have installed and started a Jabber server, you can enable Jabber server integration by creating a portlet-ext.properties file to override some properties of your Chat portlet’s portlet.properties file. You could modify your Chat portlet’s portlet.properties file directly, but it’s a best practice to override it instead. Note that you must change jabber.service.name to the “Host Name”. 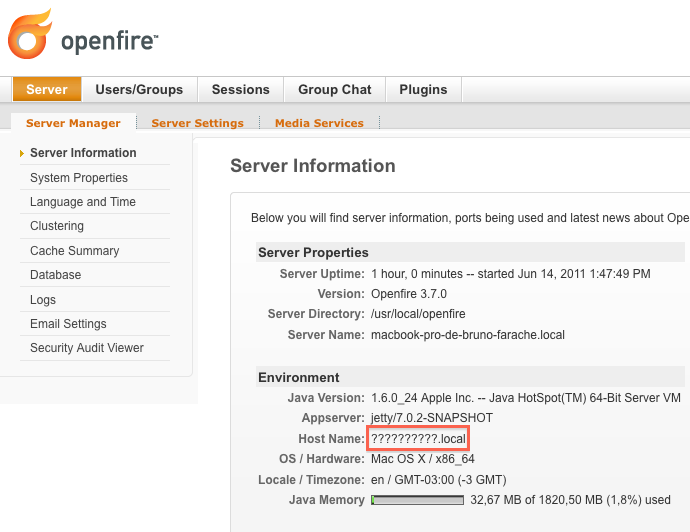 If you are using Openfire, you can find the Host Name by using the Openfire administration web tool. If you did not set up administrative credentials when you started Openfire, the default credentials are username: admin, password: admin. Additionally, make sure that you set jabber.enabled to true and have added the correct values to jabber.host and jabber.port. If you installed your chat server on a remote machine or chose to not use the default port, change jabber.host and jabber.port accordingly. Deploy your Chat portlet. Remember that this portlet must be of version 6.1 or higher. If the property jabber.import.user.enabled is set to true, the Chat portlet will import the user automatically to Jabber after he logs in to the portal. Once the user is imported, he can use any Jabber client using the same screen name and password he uses to log in to the portal. His buddies will be also imported as they become online in the Chat portlet. Note that it’s a “lazy import”. Users are imported only after they log in to the portal and their buddies will be added to his list only if they see each other within the Chat portlet. They won’t be able to use other Jabber chat clients until they log in to the portal. If jabber.import.user.enabled is set to false, users need to create their Jabber account and add buddies manually. They have to create their accounts using the same screen name and password they use in the portal. If they don’t, the Chat portlet won’t be able to connect to their Jabber account. Alternatively, since Openfire integrates with LDAP, if you are using Openfire and your portal is also using LDAP for authentication, you can disable the jabber.import.user.enabled property. Next, let’s look at how you can integrate your email addresses with Liferay’s Mail portlet.